What is it, and why is it important for lawn care? We all know the basics to lawn care. Mow, water, fertilize. Going one step beyond the basics would include aerating and soil testing. We typically recommend this be done every year though low traffic yards can typically go up to 3 years. So what is this lawn aerating you ask? Great question! The basic answer is poking holes in the dirt. Sounds simple, right? Well, it’s a little more involved than that, and keep reading to find out more. Let start by talking about how lawn aerating benefits your lawn, after all, isn’t that why you’re here? It helps the lawn to breathe. Aerating helps oxygen, fertilizer, and water to reach your lawn, all the way down to the roots. These nutrients will help the root mat to grow thick and healthy, which will be noticeable with your new lush, thick lawn. Reduce soil compaction. Heavy traffic on your lawn will compact the soil, causing soil compaction. (amazing, right?) This traffic can be from vehicles occasionally parking on the grass, foot traffic, or heavy animal traffic. Soil requires pores to help hold oxygen and moisture to maintain healthy turf. Sprinklers and rain, as well as natural settling, will all contribute to soil compaction, which is why every lawn can benefit from the service. Clearing thatch buildup. Most of our customers receive a dethatching as needed during spring cleanup, but aerating can help prevent the buildup of thatch. This can be especially helpful if you do not have your lawn dethatched regularly. Now that you know some of the benefits, lets discuss some of the methods. The 2 primary methods for aerating a lawn are using spikes, or a core aerator. There are modes of each method, and we will discuss the most popular here. 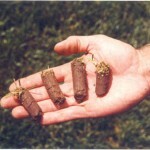 Each type should be able to penetrate the soil by at least 2”. Spikes are more basic, easier, cheaper, and typically used by homeowners that prefer to do it themselves. The most basic tool is a small handheld set of spikes that uses your body weight to insert into the soil. This method is very slow and time-consuming, even for the smallest of lawns. There are spike aerators that can be pushed, similar to a mower, and can cover a bit more ground. Similarly, you can find some 48” spike aerators that can be pulled behind a riding mower. The downside to these is the space required to store, and weight must be added on top to ensure proper penetration depth of the spikes. Core aeration is the bees knees, the cream of the crop, the best of the best, the…. OK, OK, you get it. Core aerators will actually pull a ¾”-1” cylinder of dirt out of the soil, really allowing the lawn to breath. 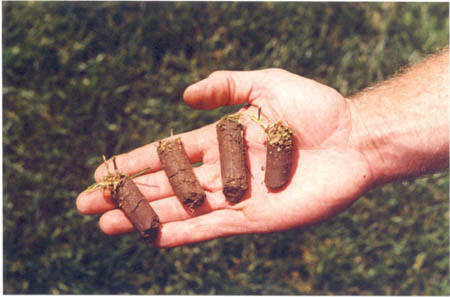 Typically these cores are left on the lawn, and will break down naturally to become part of the lawn again. Core aerators typically come as self-propelled machines or pull behind implements for your garden tractor. These can be significantly more costly than spike aerators, and are typically not purchased by homeowners. They can be rented from local companies, or it may be more cost effective to just hire Glaciers Edge Maintenance for your lawn Aeration. Get a free estimate.